We watched the first two of the Granada Television episodes of The Adventures of Sherlock Holmes last night, “Scandal in Bohemia” and “The Dancing Men”. There star Jeremy Brett, my favorite of all the actors to have portrayed Sherlock Holmes, bar none. “Scandal” is not one of my favorite stories, not is it one of the Granada episodes I like particularly well, but Barbara has not seen any of them so we started at the beginning. “Dancing Men”, however, is one of my favorite Holmes stories, mostly because of the code element. I like the way the TV episode is done, with lots of chalkboard work. Lovely stuff. I do wish they were in Blu-Ray though. If you get a chance, try the Russian tv series from shortly after. Rather impressive. The DVD case says “The Adventures of Sherlock Holmes” so that’s what I put down. Interesting. I’ve double-checked, and indeed the first series was released as THE ADVENTURES…and then they did succeeding seasons as THE RETURN OF SH, etc…and then the package as a whole was offered as SHERLOCK HOLMES by various distributors I used to deal with. So, all correct on your end! I was a big fan of Jeremy Brett’s Holmes, too. For some reason GRANADA hasn’t issued their videos in Blu-ray format. 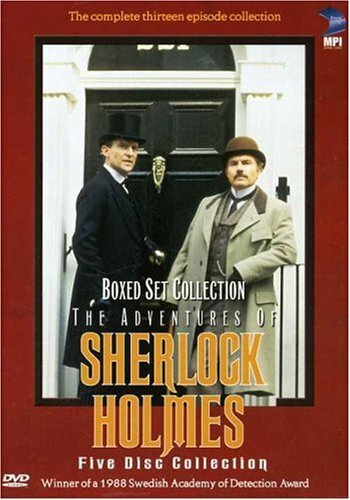 I just checked AMAZON and there’s a Blu-ray set of the complete Jeremy Bret SHERLOCK HOLMES series for $139,99. I just ordered it. I may do the same thing, George, and then donate my present set to the library. I prefer the Brett Holmes stories too, though I do have a soft spot for Basil Rathbone. I agree, Jeremy Brett’s Holmes was the best. Although I did like the recent Ian McKellen version, I can’t remember the exact title, but it was about after Holmes retired to look after his bees. Great character piece. If you mean the film, it was titled HOLMES and I agree it was very good. Whatever they were released as, they were pretty much all wonderful. Jeremy Brett was perfection as were the two Watsons, David Burke and Edward Hardwicke. I think Brett even topped Basil Rathbone, the favorite Holmes of my youth. Same here. I’ll be watching some of the Rathbone flicks too. Richard, I agree, Jeremy Brett was perfect as Sherlock Holmes. I saw several episodes of the television series years ago.